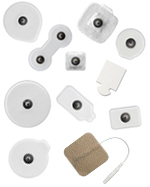 Taylor Industries is your premier source for monitoring ECG / EKG electrodes, TENS electrodes and Tab electrodes. Our latex free, hypoallergenic electrodes are manufactured here in the United States in a wide variety of shapes, sizes and materials. Along with providing a wide range of products to add to your current offerings, we can also help develop and manufacture custom electrodes exclusive to your company. Give your company the competitive edge you have been looking for. Bring production in-house with a custom-built electrode production machine from Taylor Industries. We can provide an easy-to-operate machine that is designed and built to address your specific needs.